UPDATE TUESDAY, 7.15AM: A WOMAN killed and three men injured in a horror rollover near Bouldercombe on Sunday were all from Rockhampton. She and three men were injured when the vehicle they were travelling in veered across the Burnett Hwy and smashed into a tree, about 5.30pm. A Queensland Police Service spokesman this morning confirmed the woman, 27, had lived long-term in Rockhampton and recently moved to Biloela. Two of the three men, all taken to hospital with minor head injuries, were from Rockhampton. The third was a Gracemere man. The next of kin have been notified of the woman's death after she died in the Rockhampton Hospital having suffered serious head injuries as a result of the single-vehicle rollover. 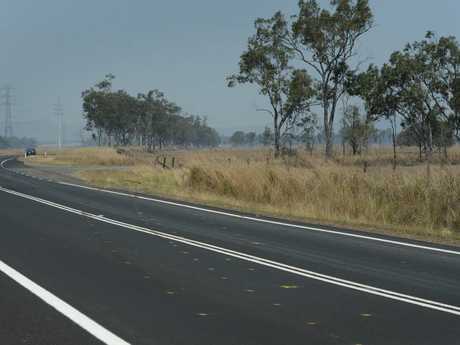 UPDATE: 12.25PM: CRASH scene images indicate the tragic moments before a fatal crash near Rockhampton last night. 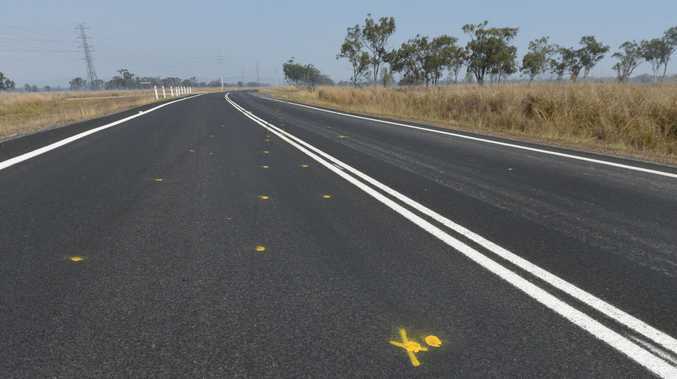 Yellow paint dotted across Burnett Hwy near Bouldercombe shows where the vehicle has veered across the oncoming lane before it smashed into a tree, killing a 27-year-old woman. The Queensland Ambulance Service reported the woman suffered serious head injuries as a result of the single-vehicle rollover, about 3km west of the Bruce Hwy intersection. The Queensland Police Service confirmed she later died in the Rockhampton Hospital. Local police this morning told media they are yet to notify the next of kin that the woman has died following the crash, which occurred about 5.30pm yesterday. Three men were also taken to the Rockhampton Hospital with minor head injuries as a result of the single-vehicle rollover. A Rockhampton Hospital spokeswoman said one was released this morning, another was in "good condition" and will likely be discharged today, and the third is stable. UPDATE 10.50PM: POLICE are still notifying a woman's next of kin following a horror rollover near Bouldercombe last night. The 27-year-old died in hospital sustained serious injuries and died in the Rockhampton Hospital last night. She was one of four people involved in the single-vehicle crash into a tree about 5.30pm after the car is believed to have crossed the Burnett Hwy about 3km west of the Bruce Hwy intersection. Three men, including the driver, were taken to the Rockhampton Hospital with minor head injuries including lacerations. A Queensland Police Service spokesman said the driver required surgery this morning. A Rockhampton Hospital spokeswoman said one of the men has been discharged, and another is in a "good condition" and will likely be discharged today. The third man is in a stable condition. Rockhampton police this morning addressed media, but were unable to provide further details on the crash or the people involved as they are still investigating. UPDATE 7AM: A SERIOUS rollover near Bouldercombe turned fatal yesterday after a woman died of her injuries in Rockhampton Hospital. The woman, aged 27, suffered serious head injuries during the single-vehicle crash about 5.30pm, which landed all four people involved in hospital. The Queensland Police Service (QPS) confirmed the two rear passengers and driver, all men, were transported with non-life threatening head injuries following the crash about 5.30pm. The QPS said initial information suggests the vehicle was travelling west on the Burnett Hwy when it crossed the road and crashed into a tree 3km west of the Bruce Hwy intersection. A QPS spokesman this morning said the driver of the vehicle required surgery. Emergency services this morning could not provide further information on the patients' ages and where they are from. 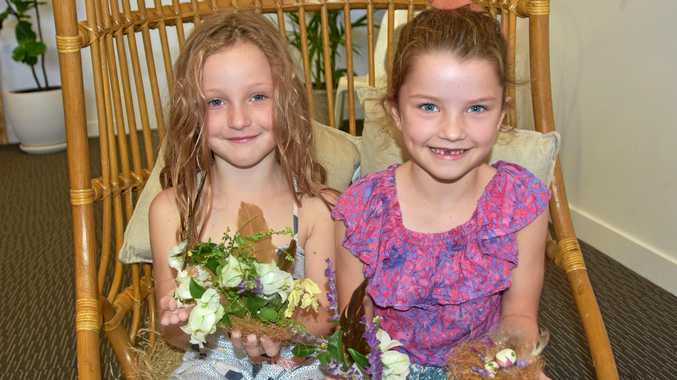 It comes after a horror week on Queensland's roads as the school holidays kicked off across the state. Latest figures show the Queensland road toll has hit 183 people this year, which is seven more people than this time in 2016. 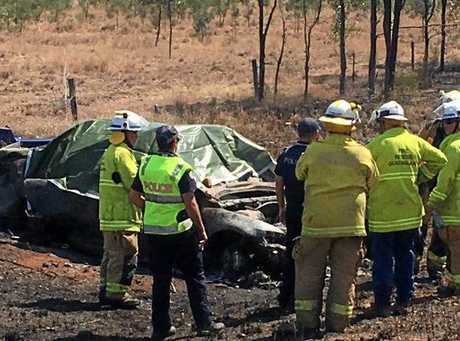 Among them is a 47-year-old Emerald woman and a 73-year-old woman from NSW, who were killed when the car they were travelling in crashed into a tree on the Carnarvon Hwy last Tuesday. The male driver, 18, and a 14-year-old boy were also from Emerald, and were airlifted with non-life-threatening injuries to the Rockhampton Hospital from the site about 40km south of Rolleston. A father and son from Mount Morgan were also killed in a fatal crash the following day, Wednesday September 20. The 41-year-old man and five-year-old boy were declared dead at the scene of the crash on the Bruce Hwy, 30km north of Gin Gin. The driver, a woman in her 30s, survived and was taken to hospital with serious injuries. She was trapped in the wreckage and suffered a badly-fractured ankle and abdominal, pelvic and back injuries. The two deceased were not wearing seatbelts and were thrown from the car as it flipped multiple times and came to a stop in the drain. If you have information for police on the crashes, contact PoliceLink on 131 444 or online 24-hours per day. Report anonymously to Crime Stoppers on 1800 333 000 or crimestoppersqld.com.au. INITIAL REPORT, SUNDAY: A WOMAN has been transported to Rockhampton Hospital in a critical condition after a single-vehicle rollover on Pierce Rd, Bouldercombe. Authorities said the conditions of three other people, who were also involved in the crash, were yet to be determined. The crash happened about 5.15pm.